As you receive this newsletter we are closing in on the July club contest. An information poster is attached. This will include the club hollow log building contest, stunt competition, and Foxberg racing. That's a lot of action, and it will all be fun. I encourage you to participate in at least one of these events if you have not already planned to. But even if competition is not your thing, please attend. Watch, help out, or just bring a lawn chair and enjoy the show. There will opportunities to put flights in between the action. So bring a plane even if you are not competing. If you know someone who is interested in control line, this is great exposure, so bring them along or encourage them to come. There will be intro flight trainers available for interested people to try. Now is the time to begin networking for the summer flying times. The membership roster which has been published this year is a great tool for contacting other members and letting them know when some flying is planned. Many times a simple phone call will bring someone out to the field who would otherwise have stayed home. Let's include as many as possible whenever we can. Speaking of networking, I am continually amazed at the amount of stuff that is available for the controline hobby. Brodak alone offers more supplies for control line than I remember being available from multiple manufacturers in the 60'S and 70's and Joe Maxwell is the local source. For specialty items, the cottage manufacturers abound. So ask other members about sources for the hard to find stuff. You will be surprised at what is out there. One last note, congratulations to all who attended and competed in the Brodak fly-in this year. Bean Hill was well represented and acknowledged at this great gathering. I've said it before, you gotta go and at least see this event if you love control line. July 8 Northeast Valley R.C. 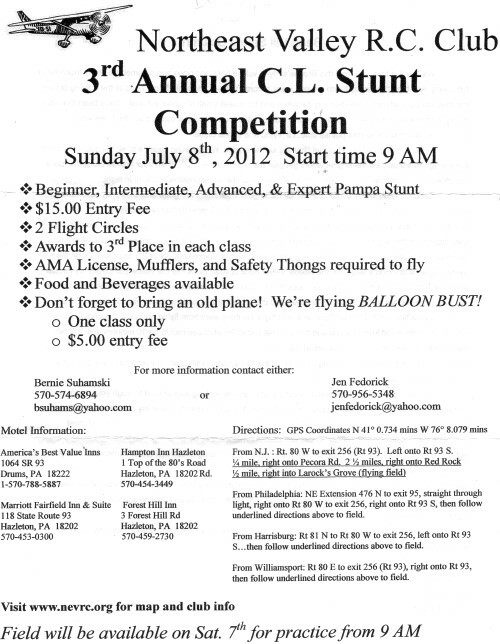 Club Annual C/L Stunt Competition. See newsletter page. 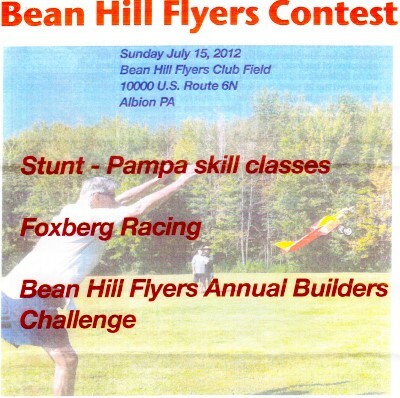 July 15 The Bean Hill Flyers first scheduled event of the year. Come to fly for fun or enter in stunt or a Foxberg race. Our club winter building event will also be on this day. See newsletter page. 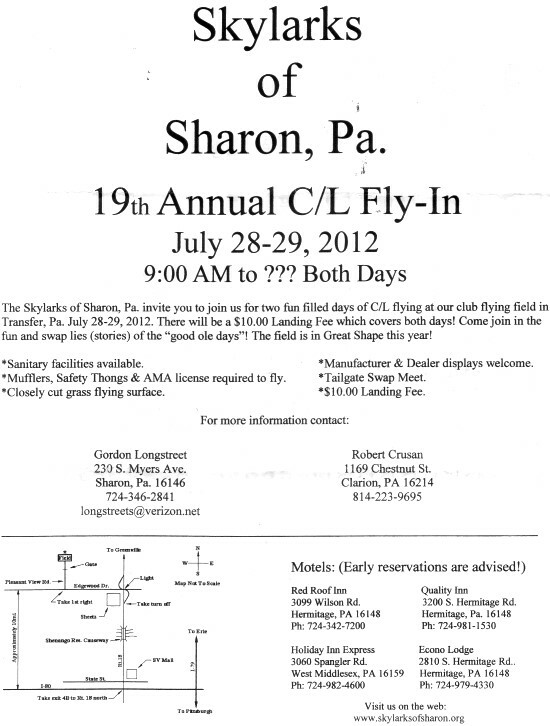 July 28-29 Skylarks of Sharon, PA Annual C/L Fly-In, 9:00 am until??? See newsletter page. August 3 Annual Club flying for the Dan Rice Days celebration in Girard, PA from 1 pm until 5pm. This is usually a rough field. This is an event that we need a number of pilots to participate in and planes on display. For information call Dalton Hammett. August 11 Annual Club flying for the Erie Model Air Show at VoTech. The hours are usually from 10am to 4pm but we use people early to help set up. This is another event that we need good club participation at. For information contact Mike Ditrich. Well by the time you read this Brodak's Fly-in will be here and gone and summer will pretty much be in full swing. As I type this on my lunch break a week before the fly-in, thoughts fill my head of the 6 flying circles, the dawn to dusk whine of nitro burning 2 strokes and the sweet smell of castor exhaust. I have been furiously trying to shakedown my planes for the coming week. I have found a couple things that I think are worth mentioning about keeping your planes safe, i.e, flying and in one piece. First off, flying WITHOUT a fuel filter will kill the engine. Kill meaning cause it to stop. I doubt anything big enough to actually kill the engine would get past the needle valve. But, when your needle fouls, the fuel is cut off and your motor stops. Inevitably, this will happen at the worst possible moment in flight. Second, flying WITH a fuel filter will kill the engine. Fuel filters are great until they plug. You have to check you filter every now and then and make sure that it's clear. I recently had two incidents. Number 1 - I have a Ringmaster with a fox .35 and a uniflow tank without a filter. (I can feel you judging me) Last flight on it, the engine quit in an overhead eight. I managed to bring it down right side up and land it no problem, but it was close. I checked the plug which was fine and sucked out about 2/3 oz of fuel. I took the fuel system apart and found a large (for the needle valve) hunk of what looks like the yellow paint from my master airscrew prop sitting on the needle when I took it out. I don't know how that would have gotten into the tank to get to the needle, but a filter would have prevented that. Number 2 - I had my Super Firecat with an OS.25 which I have a filter on it. The last flight on it, mid flight the thing went from flying normal to the engine running so slow it barely could keep the plane in the air. That lasted for what seemed to be 10 minutes until it finally quit. I took the filter apart and it was caked with dirt. Back flushed it with rubbing alcohol and the rest of the fuel system until clean. I haven't run it yet, but if that's not it, I'm out of ideas. So, as a summary, if you aren't running a filter, you're sucking a lot of crud through your motor and it can come back to bite you in the long run. Run a filter and clean it regularly. Cleaning can be accomplished by back flushing with fuel or rubbing alcohol. There are a couple types of filters, but the cheapest and most prevalent is the screw together filter. These are sealed in most cases by an o-ring. I suggest tightening the filter out of the package, attach to the end of your fueler syringe, and doing a leak test under some water. Fill you syringe full of air, put your finger over the outlet of the filter, submerge the filter under water and push the plunger. Leaks show as bubbles. This is also a good idea to do to any new tanks prior to install. If the filter leaks, unscrew it, dry it completely and dab some silicone on the threads and sealing surface and reassemble. It should be good to go. Well, I've taken my fair share of article space and while it may not have been truly safety oriented, I was not injured while writing this article, so I say it counts. and within the time limits (8 min /I 6 min for Beginner). The plane must ROG for takeoff points. There are no restrictions on the plane or engine and no muffler rule. The Foxberg Race is designed to be a fun entry level event with rules designed to help keep things even. Hot gloves and electric starters cannot be used and the fuel cannot be more than 10% nitro. The first race will be 100 laps with two pit stops after take off. The number of flyers in the circle together will be determined by the number of teams entered. If there are a large number of entrants we may elect to have a second final race of the top three or for teams for final placement. This would be a 150 lap race with three pit stops after take off. If a team reaches the required laps without a second or third pit stop their time does not end until one lap is completed after the required pit stops. No hats or safety thongs are to be worn by the pilots during the race but the pit man must wear a hard hat for protection. We will try to have some hard hats available for those who may not have one. The plane can be any profile model with a 40" - 46" wingspan. The tank must be a 2 oz. plastic such as the Dubro or Sullivan type tanks and be mounted ahead of the leading edge on the outside of the fuselage. No pressure system is to be used other than bending the tubing into the slipstream. The plane must have a normal landing gear set up of two or three wheels no smaller than 1 1/2". Larger is recommended as the planes must ROG from the grass field. Mono-wheels are not permitted. The engine must be a stock Fox .35 stunt without modifications more than replacement bolts. The NVA must be the normal Fox or a very similar in size replacement. Finally, the line length is 60' (plus or minus 6") measured from the center of the fuselage to the center of the handle and will be measured at the time of pull testing for the race. Remember, the proper way to fly a race is to have the plane straight out from the pilot, you fly high to pass only. 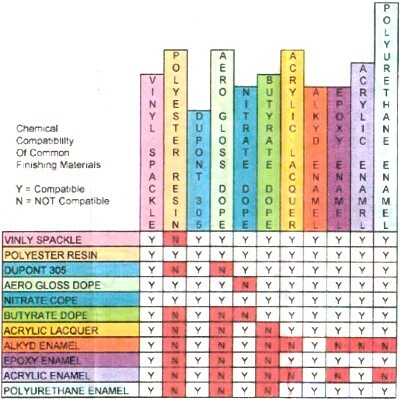 Here is a very useful chart that shows which modeling fillers and finishes are compatible and, equally as important, which are not.